Not sure why I had not seen this before. 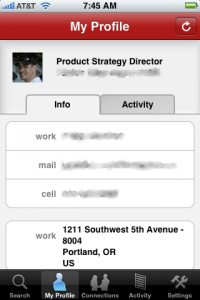 But there is an interesting post on the Oracle AppsLab showing how my colleague, Clayton Donley build an iPhone app in his spare time that takes advantage of secure access to enterprise identity sources (e.g. directory) and leverage social networking information found in Oracle Connect, our internal social network service. What is nice about this app is that it starts from a familiar paradigm: the lowly corporate address book. By using OracleConnect, the Oracle People app quickly takes you to new and interesting places by exploring the social relationships that naturally exist in an enterprise. For example, I have been using Twitter (@independentid), and I have mixed feelings about the whole technology. I just don't need to communicate that broadly about what I'm doing (after-all, I have a blog). So the idea of enterprise tweets seemed strange. Oracle People and OraTweet have created another way to find out what others are doing in a very compelling way. OraTweet really boosts the ability to communicate and interact with colleagues around the world.